Affordable Accoutrements: Rumpled Chic! For Valentine's?? Happy Valentine’s Day, everyone! This week, I’m sharing a romantic table for eight. Yes, I know it’s traditional to set a table à deux for this particular holiday. I’m speaking here in terms of romance that evokes a mood that’s fanciful and extravagant, one that offers pleasures for all the senses. The “table linens” I used were inspired by Joni of Cote de Texas. She did a post HERE that began with images of Lit a la Polonaise (a whimsical style of canopy bed that has a fabric dome on curved stretchers and elaborate upholstery details). She went on to talk about the less expensive, but equally appealing, Italian Campaign beds. She shared several examples of the metal-framed canopy beds draped in various types of fabrics. It reminded me that I once draped my canopy bed with yards and yards of gauzy crinkled cotton (which I had dipped in strong tea to give it an aged look). By some miracle, I remembered where I had stored the box of fabric. Is rumpled chic a term we could apply to table setting? If so, that’s what I set out to accomplish today. There was also an old cotton duvet cover in the box (folded inside a plastic zipper bag). I decided to use it on the table as well (the duvet, not the plastic bag). I definitely didn’t want to spend hours ironing everything, so what came out of the box is what you’ll see today. It's 65 degrees and sunny on this Valentine's Day in West Tennessee. Yesterday, however, there was still snow on the ground. Folk wisdom used to say it was "hanging around, waiting for the next one." I hope there is no "next one" anytime in the near future -- I'd be OK with waiting until Christmas. I keep telling Susan of Between Naps on the Porch that the house below is going on the market. Wouldn't it be fun to have Susan as a neighbor? Imagine how great if would be if several members of the tablescaping community lived in close proximity -- think of the potential for creative collaboration, the neighborhood theme parties, the progressive dinners ... sharing dishes and serving pieces! We'd be so busy decorating, we might have to order take-out or call in the caterers. But wouldn't everything LOOK great??? 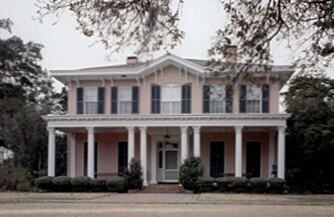 The Italianate home below, Edgewood in Natchez, Mississippi, was the inspiration for the house above. See the similarities? The Valentine's Day table is set below in the den. I used mis-matched side chairs. And mis-matched tall sherbet/champagne glasses as tealight holders. First I filled the glasses with ice cream salt -- to protect the glasses and add to the icy, transluscent effect. 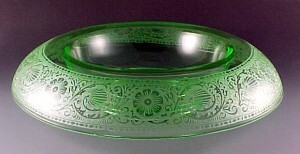 The Lenox dishes are two different patterns: Monroe dinner plates and Bellevue salad and bread plates. I recycled last week's flowers by cutting the stems short and adding aucuba (yellow/green variegated leaves) and a variety of holly. The brass hurricane lamps are thrifted. The candles were too tall, but I didn't take time to shorten them (burning them will take care of that problem!). I do like the effect of a mix-and-match table. Mixing (with a modicum of discretion) adds interest and variety. The vintage flatware is King Cedric by Oneida. I also have King Cedric butter spreaders, but decided to use a different pattern at each bread plate. A few of the roses were well past their peak, but their scattered petals added color. A "silent butler" for brushing away crumbs between courses is a practical idea. You know, of course, that I just thought it looked pretty on the table! I'm always on the lookout for discontinued/clearanced crystal stemware at department stores and gift shops. Estate sales and thrift stores can also be great sources for beautiful glasses at surprisingly low prices. I alternated between two styles of silverplated napkin rings. The napkins are thrifted restaurant linens. Happy Valentine's Day! Thank you so much for your visit. 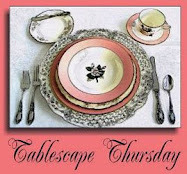 Please join Susan of Between Naps on the Porch each week for Tablescape Thursdays. Oh Course I Love every element of this setting BUT what makes it "POP" for me is the tablecloth waltzing the floor and the gauzy runner you ran down the center... That definitely made it PERFECT and gave it a "WOW FACTOR"! Bill, Your table is very pretty. I really like the two china patterns together; my favorite is the salad plate. Very pretty flatware too. Everything looks great! Glad your snow is gone; ours is almost gone too. Spring is in the air! What a beautiul romantic table. Who says a Valentine's table needs to be for two? Hope yours is wonderful. Beautiful. The way you draped the fabric is wonderful and using the sherberts with the salt as candle holders is brilliant. Very, very pretty. It got up to 66 today, and all the "white stuff" is gone (and hope it stays gone), so spent some time cleaning up the courtyard. Loved the fresh air without the cold. Have had enough. I love the risks you take with your tables. I always like the unexpected and you are really great with that. I love the flowers...the fact the roses are a bit aged just makes them all the better with this table. Your tablescapes are works of art. Your home is beautiful. Your photography is exquisite. Everything I've seen on your site is beautiful! Valentine's Day is the perfect day to "break the rules!" Sweethearts who go strictly by the rules will be more forgiving! And if they are "anything goes" people they will love the relaxed fun of an elegant but casual look! For the first time I noticed the ceiling to floor crystal storage cabinet! Beautiful! I've wondered where you store all that pretty crystal! Neat idea to use the salt with the candles! You know I wasn't crazy about the dinner plates at first but when you showed them in candlelight I became a fan. I would be terrible at this table because I know I would get my feet caught up in the fabric and ruin your whole table scape. Oh it would be so much fun to live close by. C'mon Bill. British Columbia is gorgeous and the arts community is huge. Pack up those dishes and move on up. Beautiful, as usual! Where do I get a "silent butler" that looks like yours? the idea, you and Susan would get neighbors made me smila a lot. Ghee, each of you is so fantastic in tablescaping - if your would work together, we could all quit tablescaping for the rest of our lives. Your table is fantastic, did anybody said it already? The sophisticated way you use those fabrics as tablecloth and the Hortensias and the pink lights effects of the wine glasses gave the whole scenery a mystic atmosphere. I feel taken back to the ballet performance of Tchaikovsky's Swan Lake. Just wonderful, Bill! Hi Bill, a table that I would feel very comfortable at with mismatched chairs, plates etc.. I love rose petals scattered on the table. Love your use of the fabrics too. A lovely Valentines table for friends and neighbours to share love and friendship together. Thanks Bill, best wishes, Jackie in Surrey, UK. Another absolutely beautiful table. I love the crinkled gauzy look. Mismatched might not look right in many settings but you have just done it beautifully. Your photographs are perfect. I found my tripod and I am going to experiment using that this week. Very creative tablecloths! The shot of the sun shining through the gauzy one was especially pretty. The votives in the rock salt filled sherbets gave off such lovely light! Great idea! Love the table layout, and love the risks you took with mis-matching the items. The photos are beautiful. oh such beauty such delight. My favorite part of the week is getting to see table scapes and yours are always phenomenal. I don't know how you do do it but I'm so glad you do, I enjoyed every single picture. Count me in as a neighbor! The tablecloth draping the floor and that gauze runner are magnificent! The center pice is very pretty and the china, stemware and silver ware, superb! Here's another table for my next dinner party inspiration. As always, thank you Bill for sharing. I went oriental for my last Vlentine's table! Hey Bill! Rumpled chic would be just perfect for this "rumpled chick"! :) Rumpled sounds a little more enticing than shabby! You may have coined a trendy new phrase! I loved Joni's post on the beds and that it inspired the table setting. Love all the mismatched elements and the ice cream salt is a wonderful idea. That painting over the fireplace is fabulous!! I am sure I must have seen it before, but it looks so elegant in this picture with this table setting! Hope you had a happy Valentine's Day! Hi, Bill! Glad to hear you guys are thawing out in Tennessee! We've had a few warmer days here in the Kansas City area, too, and we are expecting temps in the upper 60s over the next few days. I LOVE the eclecticism of your tablescape!!!! It really DOES make the table very interesting, and everyone angles for their favorite chair or place setting. It's like adding a "game" factor to the dinner party! The "rumpled" effect is gorgeous, too. It has an easiness about it that just says, "Come on in, sit down, rest your bones, sip some champagne and stay awhile." My kind of party! Great idea with the rock salt in the sherbet glasses!!! That looks beautiful...very wintery effect! As enchanted as I am with the table, I can't help but do a happy dance every time I look at your hardwoods in the den! They are just beautiful!!! I love ALL the wood in there! I hope you have a great week and that your Valentine's Day was a joy! I just came from the dentist's office with a sadistic, maniacal hygienist, so I'm ready to punch somebody! ;-) Checking out your post helped to mellow me out a bit. Thank you for that!!! Have a great week, Bill!!! I've been so bad about keeping up this past week! So sorry I missed this earlier, but so glad I found it now. Love the rumpled look. And the mismatched glasses too. The salt in the sherbets was a great tip! And you used my favorite china.. Lovely table and super photos.. loved the ones the next morning with the sun streaming in. It just brings so much life to the dishes and crystal. Thanks for sharing Bill! Just found your blog....wonderful! You have fantastic tablescapings. I look forward to more!! What a gorgeous tablescape. It looks so intimate and inviting....especially with the fire in the background. Bill, you do mix-and-match "with a modicum of discretion" very well! I especially love the chandelier pic -- and the fifth one from the end. Gorgeous! Bill you are a master of capturing the lighting just right...you've created a dreamland atmosphere! I love the use of the two china patterns...they have the same kind of movement in their pattern and go together so nicely! I love the gauzy crinkle cotton for the table...what a great affect! The sherbets with the candles surrounded by salt area lovely idea..you sure are creative! It looks like crushed ice but won't melt! This is a gorgeous table Bill. The lighting is wonderful and so are the photos. You nailed another one, and this time it was rumbled chic (or whatever you called it. I'm going to have to look back, but if I do I'll get sidetracked by pictures...) If there ISN'T a trend, there should be. My favorite part was the votive in the sherbet dishes. I really want to do that. And I can't believe that you're still getting mileage out of those hydrangeas! Bill, I am so glad you did the morning light photos. The light coming through the linens was great. How fun to use the old canopy. I have used old curtains before - talk about great thrifting! Love the mismatched and it really was accented by the mismatched chairs. I think they were my favorite. I would pick the tall carved one, unless of course you put my name on a placecard - might have to move the chair though - I am that kind of a girl! Love the idea of having all of the tablescaping, entertaining people living close together - what fun parties. Hmmmmm? A Tablescapers Commune??? Don't you think there would be a lot of pushing and shoving at Home Goods??? And just forget about all of those fabulous thrifing deals you always show us. I'd try to beat you there! Lovely,lovely table. Can't believe you're getting so much milage with those discounted hydrangeas. they complemented the rumply linens beautifully. Oh you are a wild and crazy guy using a rumpled cloth! I love all you mixing and matching, it came out great! A perfectly lovely table! And you know I love hydrangeas! What an elegant table. I loved all the beautiful features and that comment about the ice cream salt in the glasses with the tealights. Very helpful. Wonderful table...thank you for sharing, as always! I always think you can never possibly, ever, ever, ever, EVER outdo yourself. The gauzy draping fabric is diaphanous and like the breath of an angel whispering and singing on your tablescape!!!!! I saw Joni's post and I hope she features this as it's exquisite!!!! PS Thank you for your recent comment on my photographs/architecture. I appreciate that SO MUCH! Now I'm off to Italy to live!!!! You are a master at tablescapes and I see that many others agree with me. What is not to love about your table setting.....it is just perfect and so welcoming at the same time. I think that using the mismatched crystal does add a more casual feel to the table and makes it seem less formal, while still being elegant. The salt used to cradle the votive is really a neat thing to learn about....will definitely be using that idea. What a pretty neighborhood. I like that style of home so much. The two sherbets you show with salt in them are both Fostoria. The one with the pointy stem is the Sceptre blank but I can't make out the cutting. Cynthia maybe? The other may be Trellis. Really, really stunning. I love all the mis-matched chairs, plates, and stemware. I think it adds to the beauty of all things vintage. This is another beautiful table created by you! I love your pictures, you certainly capture the twilight hour perfectly. I love that you mix and match...so elegent! The tablecloth is a great idea! Bill, you never let us down!...you have once again set an incredible tablescape...and that would be a "hoot" to have Susan move in next door, boyOboy, there wouldn't be no stoppin yall, two creative minds together!..That would be the host/hostess with the mostess! Great minds... I too had a box of gauze from draping a bed, and I have used it for a number of things. Having your table in the den for winter is the best idea -- right by the fireplace and the bar. The way you mixed and matched your table accoutrements this week is masterful. I took notes. Hey Bill?...can you tell me how much gauze material is need for your size table and for draping? I can find that material here...I love the whole thing, it looks so elegantly European. Thank you in advance for your answer. Come visit for a little cinese tea? Thank you dearest Bill. I'm so excited you came by and visited me, and for your beautiful comment on my Asian table. Formost, thanks on the detail on the gauze tablecloth material, yeah I'd like to do that next time, it's so gorgeous! Have a wonderful day. I'm on my way to catch a plain with hubby to visit our granddaughters ! Ohhh my...your "Rumpled Chic" table is simply divine, my friend! 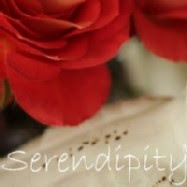 The beauty of the wrinkled muslin...fold, after sweet fold...just evokes a romantic ambiance! Sooo very perfect for a Valentine table! I just love this idea and may have to steal it from you...in fact, you may have just started another design trend! Your place settings are lovely and I love how you mixed all the different patterns of china and crystal! Just lovely! My friend, you truly do the very best floral centerpieces of anyone! I always love seeing what you're going to come up with! Thank you so much for sharing your fabulous "Rumpled Chic" table with us...as well as your gorgeous home! I sooo enjoy your photography...you really got some great shots utilizing the natural light and shadows! Love it! Beautiful, beautiful, beautiful...love the way the fabric just flows. The Lenox salad plates are gorgeous, one of the prettiest patterns I have seen. I really like the idea of putting ice cream salt in the champagne stems to prevent any damage from the tealights, thanks. your house is sooooooo gorgeous!!!!!!!!!!!!!!!!! I'm always amazed at your elegant set tablescapes. Your photography is perfect..how can one person be so creative? I'm curious what you have inside the crystal where the tea lights are sitting inside? It looks like shaved ice but it would have melted with the candles lit..I have your website bookmarked, do you have a posting showing where you store all these dishes? Your home is beautiful! Elegant! Thanks for sharing all the inspirations you've created. How do you keep up with all that you have? You must spend days polishing silver and washing fine china that "shouldn't" go in the dishwasher.